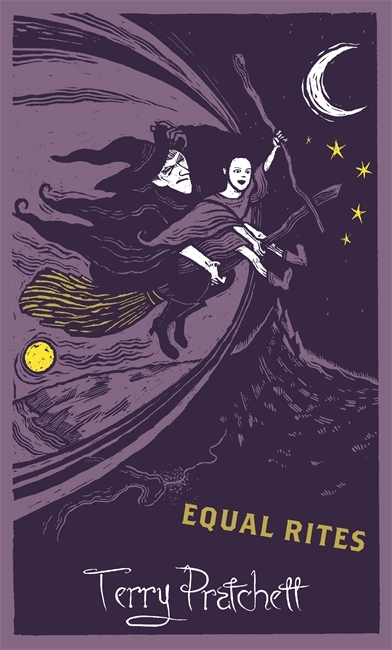 Welcome to the Equal Rites readalong! 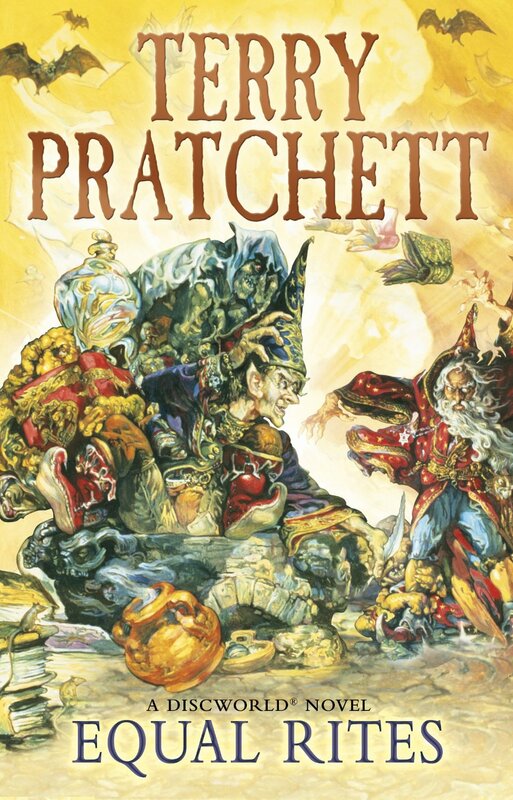 This is our first readalong of the month and, for some of you, your first Pratchett! This is the third Discworld book but the first in the Witches series. Some readers find the Rincewind books (The Colour of Magic and The Light Fantastic) a bit harder to start with. And, luckily, this book delivers all of the Discworld basics so that readers aren't short any information. You learn about the structure of Discworld -- a flat disc of earth and water on the back of four massive elephants who stand on the back of A'Tuin, the great turtle. You learn about Ankh-Morpork, the large city of grime and crime. And finally, you learn about witches and wizards. This book introduces us to the powerful witch Granny Weatherwax, a prominent figure in many of the Discworld novels. (In fact, she shows up in a full dozen of them!) 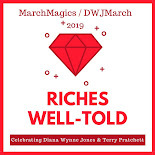 Though many readers start their journey with The Wee Free Men, the first Tiffany Aching book, I enjoyed having more of the backstory about Granny Weatherwax before getting into that subplot of the Witches story. We also get to meet Esk (Eskarina Smith), who shows up again in I Shall Wear Midnight, so also I find it's nice to know her already before that time comes. Traditionally, the eighth son of a eighth son will become a wizard. Esk is the eighth daughter of a eighth son and somehow, bucking tradition, she inherits a staff and, consequently, powers from a dying wizard on the day she is born. Equal Rites (obviously a play on the words "equal rights") establishes the lore about witches and wizards (did I just say "lore'?! ::gulp::), and especially the traditional roles of women (witches) and men (wizards). Different characters react in different ways to Esk and her desire to become a wizard. The narrow confines of gender roles are explored again in the Tiffany Aching series when one male character shows aptitude toward being a witch. Was this your first time reading Equal Rites? Did you like it? Would you rather be a witch or a wizard? Feel free to leave your thoughts in the comments below or leave a link to your own post! This was my first time, and I did like it, though having just reread the Tiffany Aching books it felt a bit like a warm-up for that series. 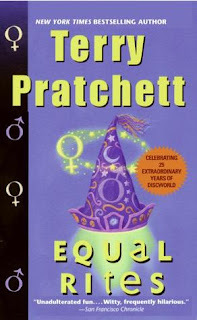 Pratchett's development of character and storyline was more mature by then, maybe; this one had many interesting elements that remained a bit unfocused for me. I love Granny Weatherwax of course, having met her already, and in this one I liked Eskarina enough to be surprised/disappointed that she didn't come back in any other books except for that cameo in I Shall Wear Midnight. I'd definitely be a witch except that I'd like to be able to read and have access to the Library. Thanks for this fun readalong! It's definitely a shorter, simpler story with more straightforward characters. Tiffany is much more complex. And it would have been great to see more of what happened between where we left Esk in this one and where we saw her later. She's, after all, an incredibly unique character! This first glimpse of Granny Weatherwax isn't my favorite. I love her older and tougher persona in the later witch books. I want to be her when I grow up. And she was more close-minded in this one than she ends up. Not that she doesn't hold strong viewpoints later but they seem to not be the kind that limit other people so much. Yes, she became a richer and more well-rounded character. It's great to see that happening in a long-running series! I've finished only two of these by Terry Pratchett so far. I didn't start reading his books until a couple of years ago really. You have to start somewhere! I've come rather late to the party, but better late than never I suppose! 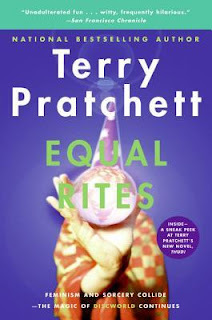 I've just read Equal Rites and a review is scheduled in two days -- luckily just in time to fit in with March Magics! 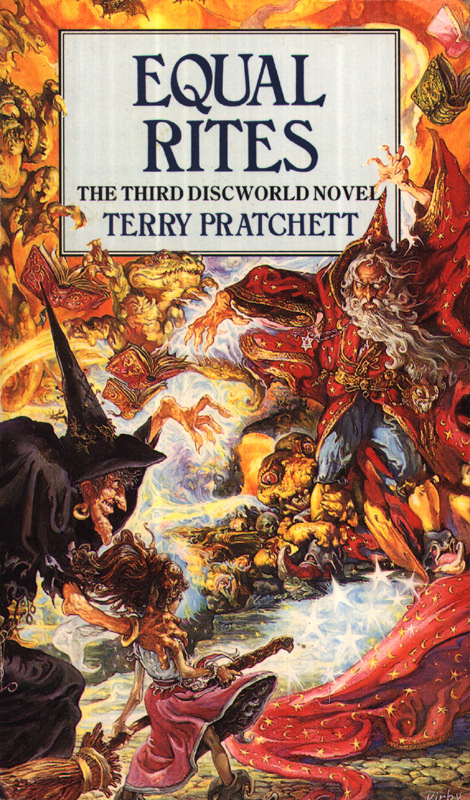 I found it great fun even though, like Lory, I've started the Discworld sequence completely out of sequence, having begun with Mort. But they seem to work as standalones, as intended, so that's all right! I've started really noticing how Pratchett makes an effort to do a quick recap of any pertinent information about characters and places. It not only helps with moving around in the series but it helps when you are reading one every few months!